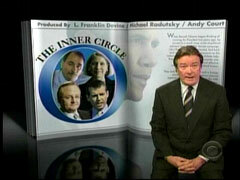 On Sunday’s CBS ‘60 Minutes,’ anchor Steve Kroft abandoned hard-hitting journalism and instead offered a glowing profile of the Obama campaign team: "Like Obama, they were talented, laid back, and idealistic, with limited exposure on the national stage. But with the candidate's help, the team orchestrated one of the most improbable and effective campaigns in American political history." Kroft interviewed Obama advisors David Axelrod, David Plouffe, Robert Gibbs, and Anita Dunn about the campaign and later observed: "The only person missing from the brain trust was the candidate himself." Kroft went on to describe their incredible accomplishment: "They took a little known senator with a foreign sounding name and almost no national experience and got him elected the 44th President of the United States. They did it by recruiting and investing millions of volunteers in the outcome, by raising more money than any campaign in history, and by largely ignoring the fact that their candidate happened to be a black man." On the issue of race, Kroft later asked: "There were just so many people -- reporters, pundits, everybody -- who said that you're not going to be able to elect a black man President of the United States. It's just not going to happen right now. Obviously that had to be part of your equation in planning this campaign." When Plouffe replied: "No. Honestly, you had to take a leap of faith in the beginning that the people would get by race, and I think the number of meetings we had about race was zero." An incredulous Kroft responded: "What?" [Warning: video contains unexpurgated F-bomb 20 seconds in]. During a break, Time's Jay Carney had apparently told a story of some politico who had used the f-word. Back on the air, Scarborough had actually been praising the discipline of the Obama team members. It was in describing them as people who, in contrast with the person Carney had mentioned, were careful with their words and deeds, that Joe's internal edit button went on the fritz. Update | Hail Halperin: See incredible video at foot. Pressed by Mark Halperin, Robert Gibbs admits Obama continued to associate with Ayers after learning his past. H/t Melody N. An Obama spokesman adamantly insists that in 1995 Barack Obama was the most clueless man in Chicago. Andrea Mitchell thinks talk of Barack Obama's ties to an unrepentant terrorist is a "distraction." Rudy Giuliani doesn't. Mitchell is happy to take the New York Times's word for the fact that Obama and William Ayers weren't close. Rudy, not so much. After the former NYC mayor made the case on today's Morning Joe as to why Ayers matters, Obama spokesman Robert Gibbs came on, called Giuliani a liar, and flatly denied that—when beginning his political career in his living room—Obama knew Ayers was a terrorist. On Friday's "Good Morning America," news anchor Chris Cuomo derided John McCain's campaign manager for a "frivolous, childish" ad comparing Barack Obama to a celebrities such as Paris Hilton and Britney Spears. Cuomo, who is the son of former New York Democratic Governor Mario Cuomo and the brother of the state's current Democratic attorney general, even tried to goad Davis into pledging to not run any similar ads in the future. He prompted, "...Your candidate started by saying he wanted to run a different type of campaign. Do you want to put out a pledge? No more ads like this? Let's leave the personal alone. Let's talk about what we'll do for America." He also played a clip of McCain pledging to run a respectful campaign and then complained, "So that's what we expected from John McCain...What's going on here?" Morning Joe: Did Axelrod 'Lie' In Denying Michelle Makeover? It's rare to hear an MSM figure flatly suggest that a presidential campaign lied, but Joe Scarborough broke out the the l-word today in wondering whether chief Obama strategist David Axelrod did just that when he emphatically denied, on yesterday's show, that there is a concerted "makeover" of Michelle Obama in the works. Let's play a Wednesday night game of WIARHSI: What If a Republican Had Said It? What if a top GOP consultant compared Barack Obama to a "dog"? James Carville, who acknowledged he was serving as an unpaid consultant to the Clinton campaign, used the metaphor on tonight's Larry King. This is getting wild . .. The Iowa caucuses might be a few weeks off, but MSNBC pundits have already cast a resounding "no" vote in a referendum on Hillary's credibility. A bi-partisan consensus of blatherers today rejected the Clinton campaign's denial of involvement in NH co-chair Bill Shaheen's raising of Barack Obama's past involvement with drugs. Meanwhile, things are getting downright nasty among top consultants to the frontrunners' campaigns . . . and Barack made Hillary regret her latest cackle.